The database is the heart of your application. You don’t see it, but it works full-time, circulating critical information to your application and keeping all the components running. We work with all the major database and datastore technologies, both to design it right and keep it running. Our talented staff has architected enterprise-level database solutions, with hundreds of thousands of daily transactions as well as those that just use a tiny fraction of the database engine. We build solutions that scale, because our clients and applications are constantly growing. We work in both Federal/DoD environments as well as commercial businesses, from small to Fortune 100. Database design not only /includes building new solutions but migrating old solutions or the initial load of legacy systems into the new solutions. 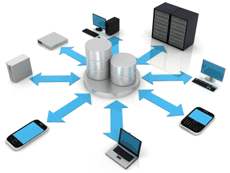 We can help with Extract, Transform, and Load (database ETL) expertise in almost every application and technology. Our certified developers use Microsoft SQL Server and Oracle database technologies every day. Most of our developers each have more than 3 years of work experience with commercial databases, open source solutions like MySQL and PostgreSQL, as well as small office databases such as SQL Express, Access, and Excel table and datatype manipulation. We can develop the turnkey solution for you, or simply help you normalize your data. ACI Database Administrators (DBAs) and developers craft efficient stored procedures and transactional queries for Oracle (PL/SQL for 8i, 9i, 10g, and 11g) and SQL Server (T-SQL for SQL Server 7, 8, SQL Server 2005, SQL Server 2008, and SQL Server 2012), as well as stored routines in MySQL 5 and higher. If you need Graphical User Interface (GUI) development for your data, our programmers and designers can help with rapid solutions in ColdFusion, .NET, and Java technologies. We implement database solutions via the web, desktop, and mobile, including the Google Go app and Datastore environment. Contact us for a free consultation meeting. We’d like to get to know your business and work together on ways to improve your data storage and access needs.